This article is about the ship. For other uses, see Eastland (disambiguation). The SS Eastland was a passenger ship based in Chicago and used for tours. On July 24, 1915, the ship rolled over onto her side while tied to a dock in the Chicago River. A total of 844 passengers and crew were killed in what was the largest loss of life from a single shipwreck on the Great Lakes. Nickname(s): "Speed queen of the Great Lakes"
Fate: Sold on June 1, 1914 to the St. Joseph-Chicago Steamship Company of St. Joseph, Michigan. Fate: Raised after accident on October 1915 and sold at auction on December 20, 1915 to Captain Edward A. Evers, sold on November 21, 1917 to the Illinois Naval Reserve. After the disaster, Eastland was salvaged and sold to the United States Navy. After restorations and modifications, Eastland was designated a gunboat and renamed USS Wilmette. She was used primarily as a training vessel on the Great Lakes, and was scrapped after World War II. The ship was commissioned during 1902 by the Michigan Steamship Company and built by the Jenks Ship Building Company of Port Huron, Michigan. The ship was named during May 1903, immediately before its inaugural voyage. After her construction, Eastland was discovered to have design flaws, making her susceptible to listing. The ship was top-heavy, which became evident when passengers congregated en masse on the upper decks. During July 1903, a case of overcrowding caused Eastland to list, with water flowing up a gangplank. The situation was quickly rectified, but this was the first of several incidents. Later in the same month, the stern of the ship was damaged when she was backed into the tugboat George W. Gardner. During August 1906, another incident of listing occurred which resulted in the filing of complaints against the Chicago-South Haven Line which had purchased the ship earlier that year. On August 14, 1903, while on a cruise from Chicago to South Haven, Michigan, six of the ship's firemen refused to stoke the fire for the ship's boiler. They claimed that they had not received their potatoes for a meal. When they refused to return to the fire hole, Captain John Pereue ordered the six men arrested at gunpoint. Firemen George Lippen and Benjamin Myers, who were not a part of the group of six, stoked the fires until the ship reached harbor. Upon the ship's arrival in South Haven, the six men – Glenn Watson, Mike Davern, Frank La Plarte, Edward Fleming, Mike Smith, and William Madden – were taken to the town jail and charged with mutiny. Shortly thereafter, Captain Pereue was replaced. On July 24, 1915, Eastland and four other Great Lakes passenger steamers, Theodore Roosevelt, Petoskey, Racine, and Rochester, were chartered to take employees from Western Electric Company's Hawthorne Works in Cicero, Illinois, to a picnic in Michigan City, Indiana. This was a major event in the lives of the workers, many of whom could not take holidays. Many of the passengers on Eastland were Czech immigrants from Cicero; 220 of them perished. During 1915, the new federal Seamen's Act had been passed because of the RMS Titanic disaster three years earlier. The law required retrofitting of a complete set of lifeboats on Eastland, as on many other passenger vessels. This additional weight may have made Eastland more dangerous by making it even more top-heavy. Some argued that other Great Lakes ships would suffer from the same problem. Nonetheless, it was signed into law by President Woodrow Wilson. Eastland was already so top-heavy that it had special restrictions concerning the number of passengers that could be carried. Prior to that, during June 1914, Eastland had again changed ownership, this time bought by the St. Joseph and Chicago Steamship Company, with Captain Harry Pedersen appointed the ship's master. On the morning of July 24, passengers began boarding Eastland on the south bank of the Chicago River between Clark and LaSalle Streets about 6:30 am, and by 7:10 am, the ship had reached its capacity of 2,572 passengers. The ship was packed, with many passengers standing on the open upper decks, and began to list slightly to the port side (away from the wharf). The crew attempted to stabilize the ship by admitting water to its ballast tanks, but to little avail. Sometime during the next 15 minutes, a number of passengers rushed to the port side, and at 7:28 am, Eastland lurched sharply to port, and then rolled completely onto its port side, coming to rest on the river bottom, which was only 20 feet (6.1 m) below the surface. Many other passengers had already moved below decks on this relatively cool and damp morning to warm before the departure. Consequently, hundreds of people were trapped inside by the water and the sudden rollover; some were crushed by heavy furniture, including pianos, bookcases, and tables. Although the ship was only 20 feet (6.1 meters) from the wharf, and in spite of the quick response by the crew of a nearby vessel, Kenosha, which came alongside the hull to allow those stranded on the capsized vessel to leap to safety, a total of 844 passengers and four crew members died in the disaster. In the aftermath, the Western Electric Company provided $100,000 to relief and recovery efforts of family members of the victims of the disaster. The bodies of the victims were taken to various temporary morgues established in the area for identification; by afternoon, the remaining unidentified bodies were consolidated in the Armory of the 2nd Regiment, on the site which was later transformed into Harpo Studios, but has since been demolished to make room for a new McDonald's corporation headquarters. One of the people who were scheduled to be on Eastland was 20-year-old George Halas, an American football player, who was delayed leaving for the dock, and arrived after the ship had overturned. His name was listed on the list of deceased in newspapers, but when fraternity brothers visited his home to send their condolences, he was revealed to be unharmed. Halas would go on to become coach and owner of the Chicago Bears and a founding member of the National Football League. His friend and future Bears executive Ralph Brizzolara and his brother were on the Eastland when it capsized, though they escaped through portholes. Despite stories to the contrary, no reliable evidence indicates Jack Benny was aboard Eastland or scheduled to be on the excursion; possibly the basis for this report was that Eastland was a training vessel during World War I and Benny received his training in the Great Lakes naval base, where Eastland was stationed. The first known film footage taken of the recovery efforts was discovered and then released during early 2015 by a graduate student at the University of Illinois at Chicago. Marion Eichholz, the last known survivor of the capsizing, died on November 24, 2014, at the age of 102. And then movement caught my eye. I looked across the river. As I watched in disoriented stupefaction a steamer large as an ocean liner slowly turned over on its side as though it were a whale going to take a nap. I didn't believe a huge steamer had done this before my eyes, lashed to a dock, in perfectly calm water, in excellent weather, with no explosion, no fire, nothing. I thought I had gone crazy. Newspapers played a significant part in not only publicizing the Eastland disaster, but also creating the public memory of the catastrophe. 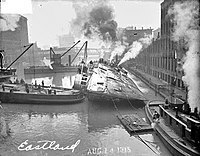 The newspapers’ purpose, audience, and political and business associations influenced the newspapers to publish articles emphasizing who was to blame and why Eastland capsized. Consequently, the articles influenced how the court cases proceeded, and contributed to a dispute between Western Electric Company and some of its workers regarding how the company responded to the catastrophe. Carl Sandburg, then known better as a journalist than a poet, wrote an angry account accusing regulators of ignoring safety issues and claimed that many of the workers were there on company orders for a staged picnic. Sandburg also wrote a poem, "The Eastland", that contrasts the disaster with the mistreatment and poor health of the lower classes at the time. After first listing the quick, murderous horrors of the disaster, then surveying the slow, murderous horrors of extreme poverty, Sandburg concludes by comparing the two: "I see a dozen Eastlands/Every morning on my way to work/And a dozen more going home at night." The poem was too harsh for publication when written but was eventually released as part of a collection of poems during 1993. The Eastland disaster was incorporated into the 1999 series premiere of the Disney Channel original series So Weird. In the episode, teenaged paranormal enthusiast Fiona Phillips (actress Cara DeLizia) encounters the ghost of a young boy who drowned during the capsizing while exploring a nightclub near the Chicago River, and attempts to learn why he has contacted her. During 2012, Chicago's Lookingglass Theatre produced an original musical about the disaster entitled Eastland: A New Musical and written by Andy White. The Eastland disaster is also pivotal to the story of one family told in the play/musical "Failure: A Love Story," written by Philip Dawkins, which premiered in Chicago in 2012. Its Los Angeles production, directed by Michael Matthews, and produced by Couerage Theater Company, premiered on July 24, 2015 – the 100th anniversary of the Eastland tragedy. A grand jury indicted the president and three other officers of the steamship company for manslaughter, and the ship's captain and engineer for criminal carelessness, and found that the disaster was caused by "conditions of instability" caused by any or all of overloading of passengers, mishandling of water ballast, or the construction of the ship. Federal extradition hearings were held to compel the six indicted men to come from Michigan to Illinois for trial. During the hearings, principal witness Sidney Jenks, president of the shipbuilding company that built Eastland, testified that her first owners wanted a fast ship to transport fruit, and he designed one capable of making 20 mph (32 km/h) and carrying 500 passengers. Defense counsel Clarence Darrow asked whether he had ever worried about the conversion of the ship into a passenger steamer with a capacity of 2,500 or more passengers. Jenks replied, "I had no way of knowing the quantity of its business after it left our yards... No, I did not worry about the Eastland." Jenks testified that an actual stability test of the ship never occurred, and stated that after tilting to an angle of 45° at launching, "it righted itself as straight as a church, satisfactorily demonstrating its stability." The court refused extradition, holding the evidence was too weak, with "barely a scintilla of proof" to establish probable cause to find the six guilty. The court reasoned that the four company officers were not aboard the ship, and that every act charged against the captain and engineer was done in the ordinary course of business, "more consistent with innocence than with guilt." The court also reasoned that Eastland "was operated for years and carried thousands safely", and that for this reason no one could say that the accused parties were unjustified in believing the ship seaworthy. 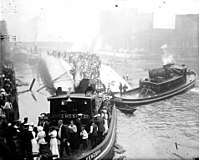 Passengers being rescued from the hull of the Eastland by a tugboat. View of Eastland from fire tug. Eastland being righted after the disaster. After Eastland was raised on August 14, 1915, she was sold to the Illinois Naval Reserve and recommissioned as USS Wilmette stationed at Great Lakes Naval Base. She was converted to a gunboat, renamed Wilmette on February 20, 1918, and commissioned on September 20, 1918, with Captain William B. Wells in command. Commissioned late in World War I, Wilmette did not have any combat service. It trained sailors and experienced normal upkeep and repairs until placed in ordinary at Chicago on July 9, 1919, retaining a 10-man caretaker crew aboard. On June 29, 1920, the gunboat was returned to full commission, with Captain Edward A. Evers, United States Naval Reserve Forces (USNRF), in command. On June 7, 1921, Wilmette was given the task of sinking UC-97, a German U-boat surrendered to the United States after World War I. The guns of Wilmette were manned by Gunner's Mate J.O. Sabin, who had fired the first American cannon of World War I, and Gunner's Mate A.F. Anderson, the man who fired the first American torpedo of the conflict. For the remainder of its 25-year career, the gunboat served as a training ship for naval reservists of the 9th, 10th, and 11th Naval Districts. It made voyages along the shores of the Great Lakes carrying trainees assigned to it from the Naval Station Great Lakes in Illinois. Ernie Pyle, the famed World War II correspondent was one of those trainees when he spent three weeks on the ship during late summer 1921. Wilmette remained in commission, performing its reserve training mission until it was placed "out of commission, in service," on February 15, 1940. Given hull designation IX-29 on February 17, 1941, she resumed training duty at Chicago on March 30, 1942, preparing armed guard crews for duty manning the guns on armed merchantmen. That assignment continued until the end of World War II in Europe obviated measures to protect trans-Atlantic merchant shipping from German U-boats. During August 1943, Wilmette was given the honor of transporting President Franklin D. Roosevelt, Admiral William D. Leahy, James F. Byrnes, and Harry Hopkins on a 10-day cruise to McGregor and Whitefish Bay to plan war strategies. On April 9, 1945, it was returned to full commission for a brief interval. Wilmette was decommissioned on November 28, 1945, and her name was deleted from the Navy list on December 19, 1945. During 1946, Wilmette was offered for sale. Finding no takers, on October 31, 1946, she was sold to the Hyman Michaels Company for scrapping, which was completed during 1947. Historical marker along the Chicago River. A marker commemorating the accident was dedicated on June 4, 1989. This marker was reported stolen on April 26, 2000, and a replacement marker was installed and rededicated on July 24, 2003. Plans exist for a permanent outdoor exhibit with the proposed name "At The River's Edge". This exhibit would be located along the portion of the Chicago Riverwalk adjacent to the waters where the Eastland disaster occurred. The exhibit is planned to consist of six displays each containing two unique panels which will serve to illustrate the tragedy through text and high-resolution images. On Sunday, July 12, 2015, one hundred years after the SS Eastland disaster, a memorial to the departed was dedicated at Bohemian National Cemetery, 5255 N. Pulaski Road, Chicago. ^ a b "Eastland Memorial Society". Archived from the original on 24 March 2016. Retrieved April 25, 2009. ^ Baillod, Brendon. "Introduction". The Wreck of the Steamer Lady Elgin. Retrieved April 26, 2009. ^ "Jenks Shipbuilding, Port Huron MI". Shipbuilding History. Archived from the original on 8 October 2014. Retrieved 26 June 2014. ^ a b "History: August 14, 1903". Eastland (1903). Maritime Quest. Retrieved 25 April 2009. ^ a b "Eastland Memorial Edition". Western Electric News. August 1915. Retrieved 14 August 2012. ^ Hilton, George W (1995). Eastland: Legacy of the Titanic. Standford, CA: Stanford University Press. p. 93. ^ a b "The Prophecy". The Eastland – Lake Erie. Eastland Memorial Society. Retrieved 25 April 2009. ^ "The Oprah Winfrey Show trivia", www.oprah.com. Retrieved on 2008-07-28. ^ "ITB: Eastland ghost stories". Chicago Bears. October 29, 2013. Retrieved November 5, 2013. He decided they needed to set up a consolidated, temporary morgue. They did at the 2nd Regiment Armory building, which later became the studios for Oprah Winfrey. ^ "ITB: Halas escapes Eastland Disaster". Chicago Bears. October 29, 2013. Retrieved November 5, 2013. ^ Rodriguez, Meredith (Feb 8, 2015). "First known film clips emerge of 1915 Eastland disaster". Chicago Tribune. Retrieved February 12, 2015. ^ "Last Survivor of 1915 Eastland Disaster Dies". Chicago Tribune. December 14, 2014. Retrieved December 14, 2014. ^ Sandburg, Carl (September 1915). "Looking 'em over". The International Socialist Review. XVI (3): 132–137. ^ Sandburg, Carl (1993). Hendrik, George; Hendrik, Willene, eds. Billy Sunday and Other Poems. Harcourt Brace & Company. p. xiii. ^ AwesomeTVShows. "So Weird 1x01 – Family Reunion". Dailymotion. Retrieved 7 March 2015. ^ Ingram, Bruce (2012-06-28). "Musical Memorial for a Chicago Tragedy". Deerfield Review. Glenview, IL: Pioneer Press. pp. 98=B. ^ "Theater Review: FAILURE: A LOVE STORY (Coeurage Theatre Company at GTC in Burbank – Los Angeles)". www.stageandcinema.com. Retrieved 22 March 2018. ^ "SIX ARE INDICTED FOR EASTLAND LOSS; President of the Company, Captain, and Engineer Among Those Held for Disaster". The New York Times. August 11, 1915. ^ "EASTLAND NEVER TESTED. ; Builder of Ill-Fated Ship Says She Was Designed to Carry 500". The New York Times. January 23, 1916. ^ "Nation Loses Point in Eastland Case; Court Refuses Application for Removal of Indicted Persons to Jurisdiction of Illinois". The New York Times. February 18, 1916. ^ a b c "Wilmette". Dictionary of American Naval Fighting Ships. United States Navy. Retrieved April 26, 2009. ^ "The UC-97". Eastland Disaster Historical Society. Archived from the original on 10 August 2007. Retrieved 26 April 2009. ^ "USS Wilmette". Eastland Memorial Society. Retrieved 26 April 2009. ^ "History:Aug.1943". Eastland (1903) Builder's Data. Maritime Quest. Retrieved 26 April 2009. ^ "At The River's Edge A permanent outdoor Eastland Disaster exhibit". Eastland Disaster Historical Society. Retrieved 29 January 2016. 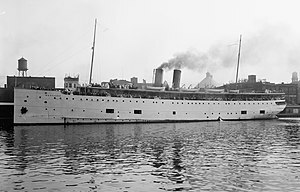 Wikimedia Commons has media related to Eastland (ship, 1903).